Two volumes (23 cm), viii, 1224 pp. ; 141 pp. Publisher’s blue cloth, printed dust jacket (vol. 1); publisher’s blue cloth (no dust jacket distributed). Offered with Proctor (Robert), An index of German books 1501-1520 in the British Museum (Holland Press Bibliographies, 3). London: Holland Press, 1954. - Facsimile reprint of the 1903 edition. ¶ Excellent copies. (23 cm), viii, 1224 pp. Publisher’s cloth, printed dust jacket. 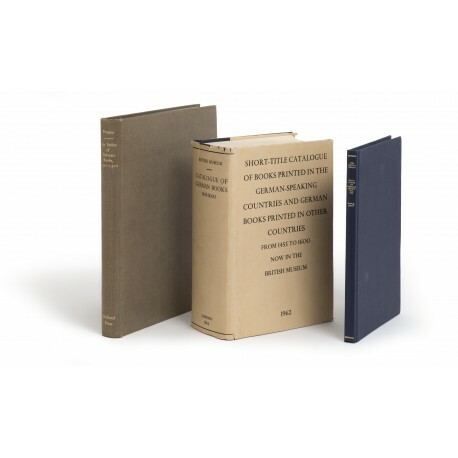 - Author catalogue of approximately 3500 incunables and some 19,500 sixteenth-century books. 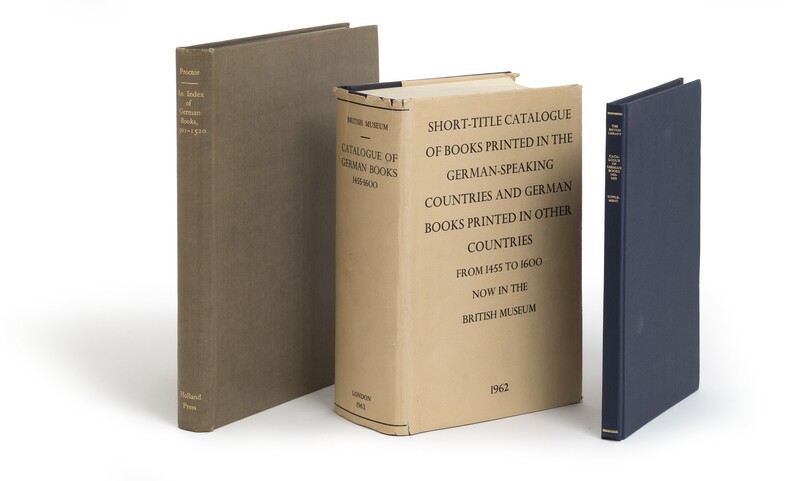 One of the ways in which a bibliographic catalogue makes a collection accessible is through its indexes, in particular of printers and publishers, arranged by name and by town, with dates of publications. These show at a glance a conspectus of production, family and business connections and peregrinations, and associate many items which would not be connected so easily by other means. Such information cannot easily be extracted from the online catalogue (if at all), and the Library’s STC remains an essential volume in the bibliographer’s armoury. ¶ Short tears in dust jacket; otherwise an excellent copy. (23 cm), 141 (1) pp. Publisher’s cloth (no dust jacket issued). - Catalogue of more than 1300 books added to the Library since 1962, or omitted by oversight from the earlier work. Also includes amendments to the original entries, notably a list of books destroyed 1939-1945. There is a consolidated index of town with dates of printers’ and publishers’ activity. ¶ Binding finger-marked; otherwise as new. (25.5 cm), (4) 273 (1) pp., 66 illustrations. Publisher’s cloth. - An invaluable work detailing the types employed at each press, woodcut border ornaments, initials, and devices, together with the entries for the books. It is still an essential work for the identification of books sine nota. Reprint of Proctor’s An index to the early printed books in the British Museum. Pt. 2 (1501-1520), Section 1. Germany (London, Kegan Paul, 1903), published in an edition of 350 copies, and long out of print. ¶ Light shelf wear; otherwise an excellent copy.